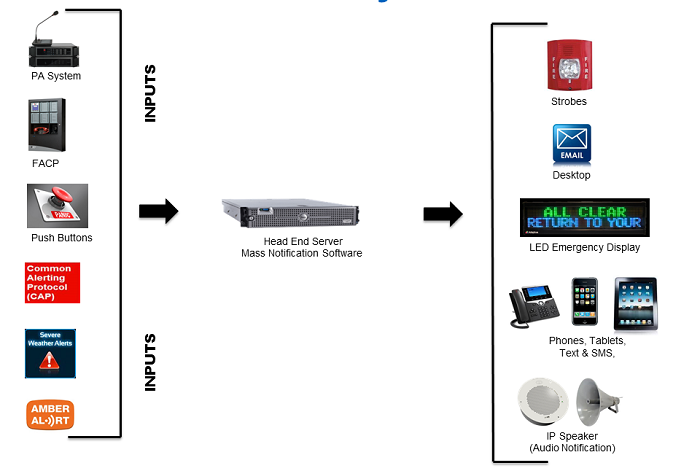 Our Unified Communication System offers internal and external full color LED Displays with flexible architecture. Full Color LED Displays can be integrated with a variety of emergency notification and life safety platforms. This includes Emergency Communication Systems (ECS), Mass Notification Systems (MNS) and network-centric, crisis communication platforms. The instant an emergency or crisis event is triggered preprogrammed, targeted messages are sent to the display. The Salescaster Mass Notification System is also capable of send first-responder and custom follow-up messages. ► Supports integration with leading fire control panel manufacturers and network-based emergency notification providers through open communications protocol.